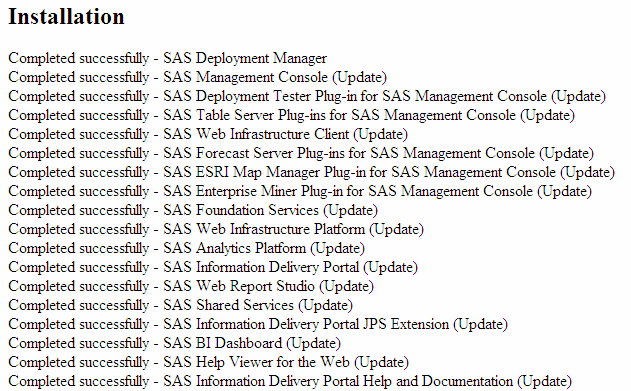 During the installation process, a Deployment Summary is saved in the SAS-installation-directory directory. If you exit the SAS Deployment Wizard without installing any updates, then the Deployment Summary is not saved to this directory. Note: A Deployment Summary for each previous installation is saved in the home directory of the user ID that was used to install SAS. 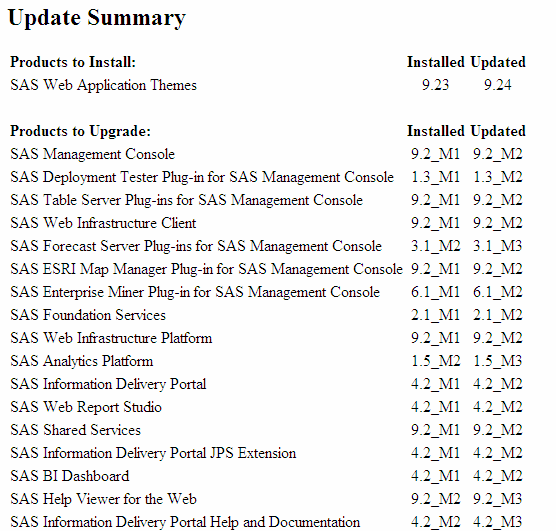 The Deployment Summary for the latest installation of the maintenance release is always available from SAS-installation-directory/InstallMisc/InstallLogs/. The Products to Install category lists any new products that you are installing or any products that you are upgrading to a new release. The Products to Upgrade category lists the products that will be updated when you apply a SAS maintenance release or a product-specific maintenance release. The Installed column lists the product release number that was on your machine before you applied the maintenance release or product upgrade. The Updated column lists the product release number that is on your machine after you have applied the maintenance release or product upgrade. For each product in the Deployment Summary, review the information in the “Product-Specific Details and Post-Configuration Requirements” chapter in Parts 2, 3, and 4 to determine the configuration steps that are necessary for your site. If you do not complete these configuration steps, you might experience unexpected behavior or errors that will affect the use of your SAS software. To complete the post-configuration steps for the third maintenance release for SAS 9.2, see Product-Specific Details and Post-Configuration Requirements in Part 2. The Installation section lists whether each product update installed successfully. In the following example, all products installed successfully, so you can complete any post-configuration steps for these products. However, if a product installation failed or completed with errors (such as the SAS Add-In for Microsoft Office in the following example), review the audit files for that product. For more information, see About the Audit Files.